"We hired Dustless Reshine to sand, stain and finish our existing hardwood floors, and replace the carpet in our adjacent dining room with hardwood. 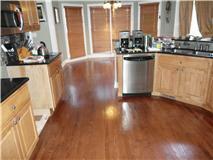 We are very pleased with the results and how well the existing floor was stained and finished to match the new floor. The floors are beautiful and the employees were very professional. 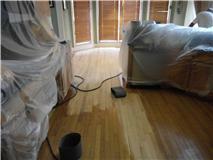 There was very little dust and mess and the work was completed in the given time frame and at a very reasonable price. 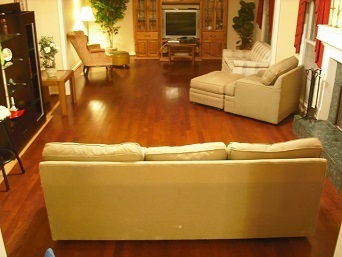 We would recommend Hardwood Flooring Experts services to anyone." Wow! We are thrilled with the results of our floors. They are beautiful. Thanks so much! Your employees were exemplary! Professional, on time, neat; what a fine crew. I was amazed at how little dust and sand there was with your process.It was by far the best experience we have had. Thank you Arturo, continued success!" - ​​T. Mordasly Marietta, GA.
We love our floors! Thanks for the terrific job.